Another book from the TBR shelf- I bought this when I was in Finland and have always meant to read it as my dad’s side were immigrants from Finland. The book is brief but covers the important events from pre-historic era through the tumultuous 20th century social and political events. I knew quite a lot of the history here, Klinge is a bit more circumspect than others I’ve read – he writes with as little controversy as possible not really covering the Reformation or post-WWI Civil War eras. Although the book is almost entirely political history, there is some social history covered. I think the book has a slightly pro-Swedish pov. One thing I did not know was that – “The payment of reparations in full in 1952 and the Soviet Union’s relinquishment of the Porkkala base in 1955 removed the last restrictions to sovereignty.” I knew the reparations were paid off promptly and that they were heavy but not the rest of the sentence. I also didn’t know that universal suffrage was granted quite so early in Finland – the first country in Europe! I suppose this is a good start to further reading although there really isn’t much in English. Nice black and white illustrations and a few maps. 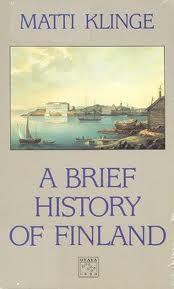 Wow, it is great that You are interested in Finland’s history. I do not agree You with this: “One thing I did not know was that Finland had war reparations to Russia after WWII. They were not heavy and were paid off by 1952”. The fact is that they were heavy! Check it and then You know. BTW, I appreciate Matti Klinge, but am astonished if he says so. Well, as You know, some are richer than others and my family was poor as also my wife’s family. Time after war was hard because we had shortage of everything! Can You imagine that it was in 1952 when Finland had in Helsinki Olympic Games, the Coca Cola was brought at first time here. You might search the place from where You dad’s side moved from my blog. Thank you, Sarenada! I went back and checked the book and you’re right, Klinge doesn’t say that at all. The sentence I transcribed in my mind reads, “The payment of reparatinos in full in 1952 and the Soviet Union’s relinquishment of the Porkkala base in 1955 removed the last restrictions to sovereignty.” I will have to fix my post – Thank you. Also, I really enjoyed your photos of Eastern Finland – Karelia. Love those little onion domes and the flowers. I just took that whole sentence out because what Klinge wrote is what I thought- reparations were very heavy and they were paid off by 1952.